Tehnoexport Company in its rich supply offers a wide range of bathroom floor drains. 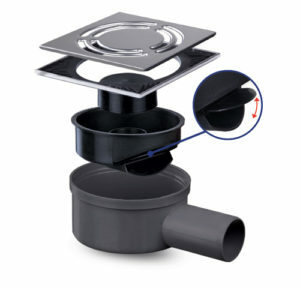 Texo floor drain has a stainless steel mask, body and ceramic holder made of technical plastic (ABS). Texo floor drains are available in different sizes. Texo floor drain has modular and flexible system, high flow rate up to 48l per minute and a minimal installation height of 85mm. We have a wide range of models and sizes in our offer. Texo floor drain represents an advanced designer solution while years of experience in drain production guarantee high quality and functionality. We would emphasize the innovations we have made in floor drain which can be seen in double protection from unpleasant smells achieving this with water barrier so as with mechanical protection.